San Francisco, California is the second most expensive US city to live in. It’s also awash with human feces. 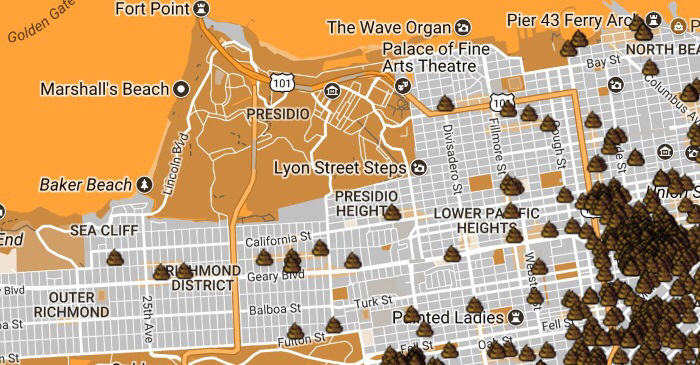 This year there have been over 16,000 feces-related complaints lodged with the city. “Human feces still not cleaned up despite multiple complaints. How many weeks will pass?” reads one complaint. “Bodily fluids and feces down the whole street, garbage, clothes, food is thrown all over the sidewalk,” reads another. “Homeless encampment is blocking the sidewalk and creates a health hazard w trash and feces. Please move them, and send a cleaning crew. The sidewalk is impassable, forcing pedestrians into the street,” reported one user, his complaint accompanied with a photo of a tent pitched under a tree in the city’s central Mission district. There are an estimated 7,500 homeless people in San Francisco at any given time. This is almost one percent of the city’s 871,000 population. Elsewhere in California, the problem is almost as grave, with more than one-quarter of the US homeless population living in the state. A February NBC report revealed that in addition to feces, downtown San Francisco is polluted with more garbage and used syringes than some of the world’s poorest slums. Mayor London Breed won her election on a promise to clean up the city. Breed has made unannounced walks through hard-hit neighborhoods — with reporters in tow — but without giving the police or Public Works officials a heads-up that would allow for the cleanups that usually precede a mayoral visit. “I don’t want the areas to be clean if it’s not clean on a regular basis. I want to see what everybody else is seeing,” Breed said. And when Breed sees a problem, she texts the department head. The sight of human waste, hypodermic needles and trash is nothing new to anyone walking in the downtown Mission District or in any of a number of other San Francisco neighborhoods. San Francisco Public Works has a $72.5 million-a-year street cleaning budget. This includes spending $12 million a year on what essentially have become housekeeping services for the homeless. The costs include $2.8 million for a Hot Spots crew to wash down the camps and remove any biohazards, $2.3 million for street steam cleaners, $3.1 million for the Pit Stop portable toilets, as well as the new $830,977-a-year Poop Patrol to clean up all human waste. The poop patrollers earn $71,760 a year. Each member of California’s tax-funded poop patrol will earn over $184,000 per year in salary and benefits. The Department of Public Health has an additional $700,000 set aside for a ten-member, hypodermic needle cleanup crew, that includes their own minivan. The $19-an-hour needle cleanup jobs were approved as part of the latest budget created largely by former Mayor Mark Farrell. This new crew is in addition to the $364,000 that the health department was already spending on a four-member needle crew. Breed is pushing Chief William Scott for more foot patrols. “I’ve definitely had discussions with the chief and asked that beat officers be out there,” Breed said. City officials state that foot beats have nearly doubled in the past year, from 76 to 140 officers. Breed says that the burden of solving all the city’s street problems doesn’t rest solely on City Hall. How does Breed expect these liberal ideologists to comprehend the meaning of “People shouldn’t be comfortable throwing their trash on the ground” when the left has been granted their “sense of entitlement” philosophy and anyone who disagrees is a “Misogynist, Racist Bigoted Pig”? If all conservatives moved out of the s*hole, San Francisco wouldn’t survive. They need the tax money to keep the s* off the ground.